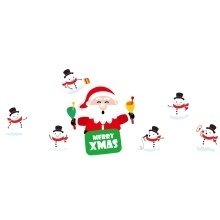 100% Brand new and good quality Christmas Decorations Stickers! Non-toxic, environmental protection and water-resistant, great for windows, walls, tiles, glass, furniture, doors, mirrors or any other flat and smooth surface. Easy to use, just peel and stick. Odorless & non-toxic, environmental protection and water-resistant. Made with self-adhesive PVC that can be removed easily without leaving residue. Self adhesive design, easy to use, just peel and stick. You can design the pasting effect as you like. Can be used for windows, walls, tiles, glass, furniture, doors, mirrors or any other flat and smooth surface. A great Christmas decoration, which can add strong festival atmosphere at Christmas.